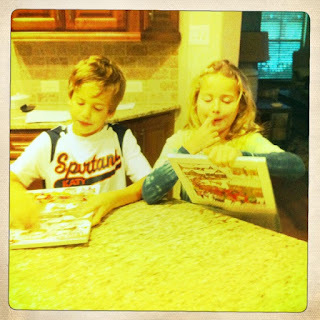 December morning ritual...one piece of chocolate from their advent calendar that Aunt Charisa gives them every year. It's amazing how much faster they can get out of bed in the morning for school. Just another one of our Christmas traditions that we love! Love traditions! It's funny not to see winter coats on too. Glad they still enjoy them! Everyone needs a little chocolate to start their day! Hey I live this blog!! But I love the jersey Jack is Rollin in!!! Tight!